Even though it’s only Tuesday, my week is already fantastic. I was able to finish all of my finals early last week so I would be able to come to Ottawa, Ontario, to attend a summer music program! So yes, I’m technically blogging internationally, which is totally a first for me. I’m having so much fun meeting other kids and seeing some old friends too, and I can’t wait to spend 2 weeks here. In addition to all of the music fun that’s been happening, we had our yearly gymnastics banquet last Friday night. It was so sweet seeing everyone from the gym dressed up in their pretty dresses and sparkly shoes (especially the little kids), but it was also emotional because the gymnast who is a senior this year is leaving after 16 years at Arena. We are all so proud of her and know that she’ll be an absolute start in college gymnastics! 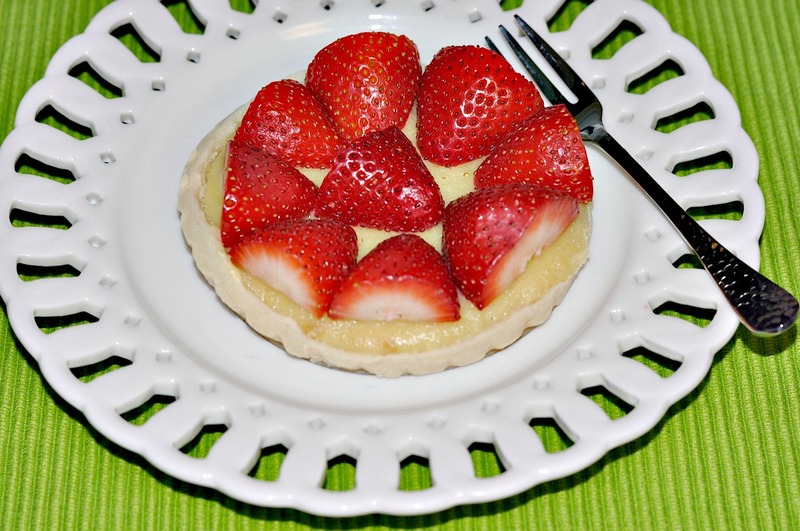 Since my summer is just beginning (even though it’s not June 21), I thought that I would share an absolutely delicious tart with you guys. My mom has been working away at her website, which is sure to be launched in August, and I’ve been helping with a lot of the baking. 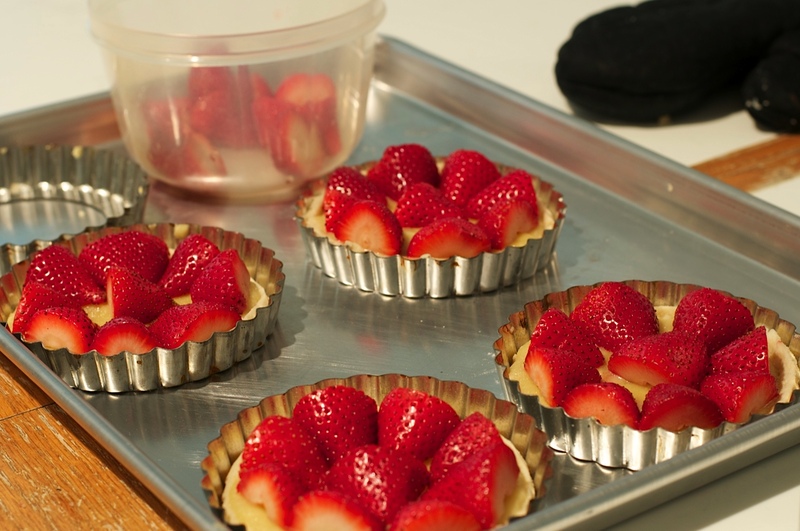 We had a nice selection of strawberries that were begging to be used, and they were just too pretty to shove into a pie or crumble. This recipe is courtesy of Molly O’Neill, former food writer for the New York Times. 2 pints fresh strawberries, hulled and halved Confectioners’ sugar, for garnish. 1. Place the flour, salt and sugar in a food processor and pulse to combine. Add the butter and pulse until butter is the size of small peas. Add the water and pulse until dough barely begins to come together. Press the dough together with your hands, flatten into a disc, wrap in plastic and refrigerate for 30 minutes. 2. Preheat the oven to 350 degrees. Roll the dough out to a thickness of 1/8 inch. Fit it into a 9 1/2-inch quiche dish. Line the crust with parchment paper, fill with pie weights or raw beans and bake for 25 minutes. Remove the paper and the weights and bake for 2 minutes more. Set aside. 3. Place the almond paste and butter in a food processor and process until smooth. Mix in the flour, sugar and salt. Add the egg and vanilla and process until smooth. Scrape the mixture into the tart shell, spread into an even layer and bake until set, about 15 minutes. Cool. 4. 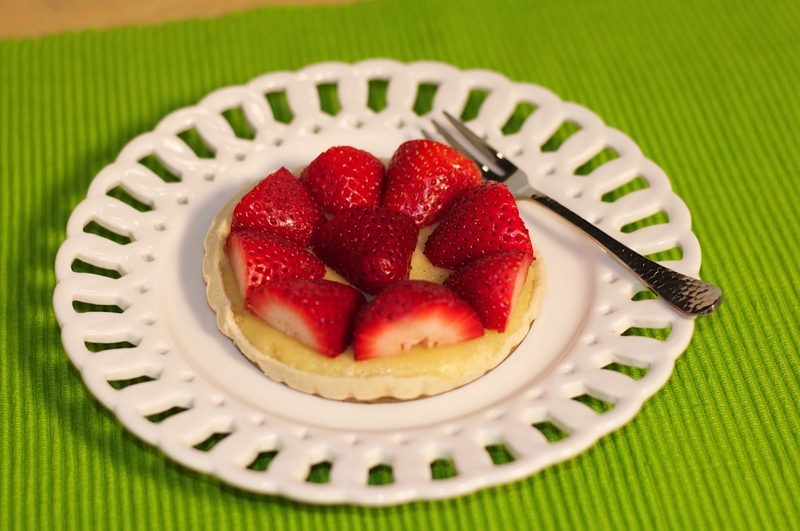 Make a ring of strawberries around the edge of the dish, leaning the cut side of the berries up against the edge. Repeat, making concentric circles until the tart is covered. Just before serving, sift confectioners’ sugar over the top. Cut into wedges. Serve. A perfect way to start off an amazing summer. That’s right, a Blackberry Swirl Pound Cake. This dense delight has swirls of sweet blackberryness in every bite. Although it takes over an hour to bake, trust me, it’s worth it. Say goodbye to your bowl of cereal and say hello to heaven! You could use any berry you want, raspberries and blueberries are more than okay to use. Mixed Berry Swirl Pound Cake anyone? With a dollop of some freshly made vanilla whipped cream? Say goodbye to the perfect summer body and say hello to the perfect summer breakfast/snack/dessert! Preheat the oven to 350 degrees and spray a 9×5 loaf pan. In a food processor, puree the blackberries and 2 tablespoons of sugar. In a separate bowl, mix together flour and baking powder. In another bowl, cream together the butter and 1 1/4 cups sugar until smooth. Add in eggs and vanilla extract. Mix in the dry ingredients and the sour cream, alternating between them. Add 1/2 of the dough into the loaf pan and spread to the edges with a spatula. Dot 1/2 cup of the blackberry puree on top . Add on the remaining dough and then the remaining puree on top. Take a knife or skewer and swirl the batter and the puree together. Bake for 1 1/4 hours, or until a toothpick comes out clean. Cool for at least 30 minutes before taking out of the loaf pan. Excuse me while I hide this delectable dense delight before anyone else can get to it. Just another teenage girl trying to manage my homework with my cookbooks, all while flipping in the air at the gym and playing classical violin and viola. Enjoy!